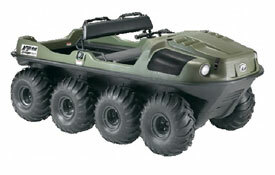 We are proud to provide you with the most versatile unit in amphibious, all-terrain transportation through the power and versatility of Argo amphibious UTVs. Argo has become known as the “go anywhere” option for offroad travel. The multi-passenger Argo can safely carry your crew and gear where other vehicles can’t. In muskeg, thick boreal forest, or deep snow; the Argo gets stuck less, carries more than most other offroad equipment options. At Pioneer, we equip our Argos with a 4,700 lb winching system, 12 V plugin, durable tracks, ROPS, fire extinguisher and a trailer hitch to optimize the Argo’s capabilities. Moreover, the option of Pioneer’s unique Argo hard cab with a heater increases your productivity when the weather is not cooperating. Dimensions L: 117" H: 75" W: 72"